The facial hair transplant is the surgical technique that carried out with the individual hair follicles from any part of body named donor site. These follicles are grafted to the balding part of the body called recipient site. The facial hair transplant is the process carried out for the restoration of eye lashes, eyebrows and beard hair. This transplant is also used to fill in scars caused by surgery or accidents. The facial transplant is carried out with the grafts containing hair follicles that are genetically resistant to balding. The process is carried out with tiny grafts instead of single strip of skin. 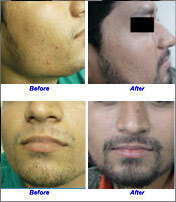 The facial hair transplant includes the eyebrow hair transplant, eyelash hair transplant and beard hair transplant. The fuller and natural eyebrows makes the face looks beautiful. 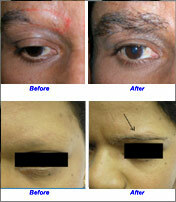 The eyebrow transplant therapy serves as the permanent way of restoring the hairs of eyebrows. 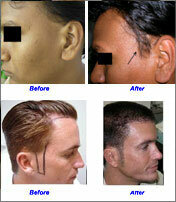 The eyebrow hair transplant can be of with any reason, be it some accident or hereditary. With our confident medical team we are feeling proud by offering the facility of eyebrow hair transplant. The donor area is prepared. For this treatment the hairs are taken from directly behind the ears. The hairs taken out from the donor area and carefully transplanted to the recipient area. The procedure is performed under local anesthetic and patients will comfortably fall asleep while carrying out the transplant. Eyelash hair transplantation is also known as eyelash implant. 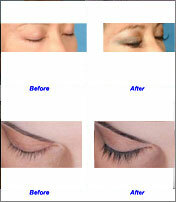 It is a new procedure that was used for the treatment of eyelids that are without eyelashes. This can be due to any reason, be it genetics, alopecia or trauma. The procedure is also carried out on people who already have eyelashes for the thickening and enhancing the appearance of eyelashes. The hairs that are to be grafted comes from the scalp and need to be trimmed once in a month as these hairs tends to grow. The eyelash hair transplant is a delicate procedure that require perfect placement. These are to be angled at right direction and at right position. The procedure involves the placement of hairs into each upper eyelid. This placement depends upon the desired size and density of hairs. The procedure is of two hours and is performed under the mild oral sedative. The procedure of Beard Hair Transplant is carried out for the restoration of hairs in facial areas where the growth is missing or very thin. The procedure is most commonly performed on the mustache and beard areas with having sideburns and scars. The loss of hairs can be due to various reasons, which includes genetics, injury, electrolysis, laser hair removal or burns. The hairs that can be grafted will be taken from scalp. These hairs have all the characteristics of normal facial hairs. The transplant is performed under the oral sedative and lasts between 2 to 5 hours of time. It is a painless process and the patients can resume their day to day non stress activities by second day.